Clear Quartz healing tumbled stones. Most are clear. They are also very bright in their look and energy. Size of 1 inch (Some just a smidge smaller or larger). 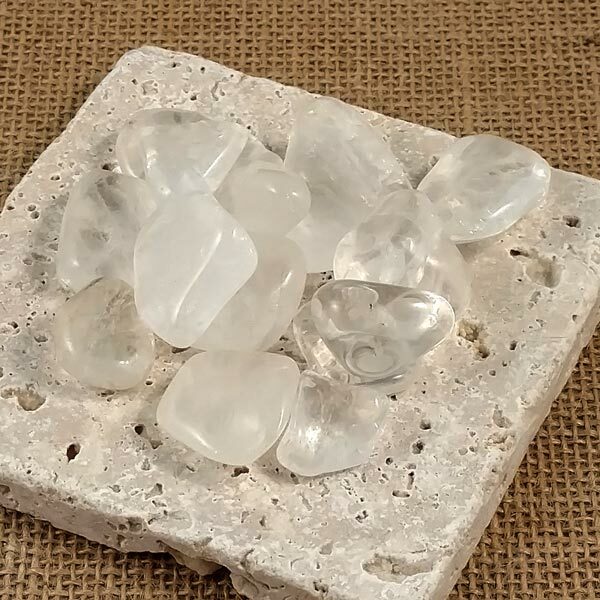 Clear Quartz helps to solve problems in simple ways and revitalizes capabilities you thought you had lost. Fills the aura, Chakras and aura bodies with light, heals the etheric and emotional bodies. Clears negativity at all levels, protects from negative energy and detoxifies the aura. Promotes and intensifies spiritual expansion, awareness and enlightenment. Aids emotional stability, helps all physical and emotional diseases, speeds healing and brings goodness to every level. If you lack a good gem choice, Quartz is the one that can actually be used at any Chakra. Quartz has a trigonal crystal system and is in the mineral class of oxides. It is formed in passages or hydrothermally in druses or clefts from a pure, silicic acid solution that contains no foreign substances. Free-growing crystals can vary from long and slender prisms to crusts or 'points'. There are usually six terminal faces that develop larger and smaller faces horizontally. Quartz can occur almost anywhere. Veins formed in high temperatures are usually coarsely crystalized. When formed in low temperature veins, in geodes and sedimentary rocks, we enjoy the finer grained varieties. Clear quartz veins have been guides to miners to find gold in many regions for many years. Quartz can be carried or worn anywhere. When used in conjunction with other stones and gems, it will amplify their effects and attune the treatment to the energy of the individual. 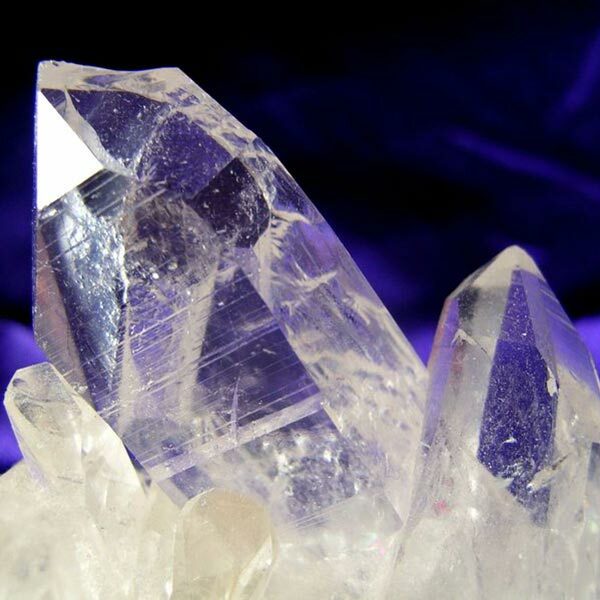 Quartz recalls forgotten memories and brings them to conscious awareness. It helps to solve problems in simple ways and revitalizes capabilities you thought you had lost. Quartz brings self-knowledge and helps to overcome what you believe to be your mental limits. Quartz revitalizes parts of the body that have lost feeling, are cold, numb or paralyzed. It balances the working of both halves of your brain, fortifies your nerves and stimulates glandular activity. While it supplies energy, it can still reduce fever and alleviate pain, swelling, and nausea. Quartz has a special affinity with Sagittarius, but benefits all signs. It helps to tune in to your own energy and filter out distractions so it is a good stone for almost any profession. Its Energy is Projective and Receptive, its Planets are the Sun and Moon, and its Elements are Fire and Water. The term suisho is used in China to designate Clear Quartz. It reflects the ancient idea that Quartz was ice frozen so long it could not be liquified. In Japan it is considered to be the frozen breath of the White Dragon. The Greeks thought it was deeply frozen ice (krystallos) that couldn't be thawed. Quartz is also called 'rock crystal' in many cultures, including the US. It has been believed to have powers to drive away demons and disease and has been used as a strength and energy supplier. Clear Quartz spheres have also been used for centuries for scrying (predicting/seeing future events).